If you're looking for information on how to convert your semi automatic UZI to full auto, you've come to the wrong place. It's illegal and the UZI Talk web site will offer no help to anyone doing a conversion. But converted guns are a fact of life for UZI collectors. Prior to 1986, several class II dealers legally converted semi automatic UZI's into full autos and they are transferable to individuals. If you're thinking about buying a full auto IMI UZI, it almost certainly is a pre-1986 conversion. Before you buy, you should understand a few things about the conversion process and the issues (both operational and legal) that may arise from it. The first thing to understand when looking at a converted UZI is what the registered part is. That will have a significant impact on what you can and cannot do with the gun. When class II manufacturers were registering new machine guns prior to the 1986 ban, they could choose which part they wanted to serial number and register. Typically that was one of two parts for an UZI - either the receiver or the bolt. 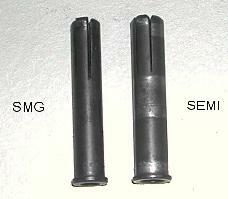 These are the two parts that are generally incompatible with each other when mixing semi automatic and full automatic parts. By registering one of the parts as a machine gun, it could be modified in ways that would otherwise be illegal. 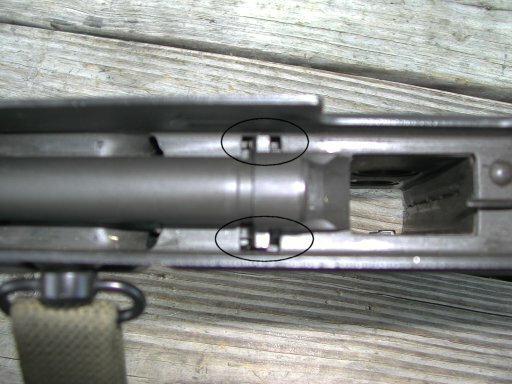 For example, if a bolt was registered, the manufacturer could then cut a slot in the side so it would work in a semi automatic receiver with a blocking bar. Or if the receiver was registered, the blocking bar could be removed, permitting the use of an unmodified SMG bolt. The registered part gets modified and the non-registered part remains essentially unchanged so that it's still legal when the registered part is removed. There are advantages and disadvantages for each of these choices. With a registered bolt, the bolt can be freely dropped into difference receivers. A damaged receiver can be easily replaced and the registered bolt is reused. Unfortunately, a registered bolt generally doesn't permit caliber conversions. Installing a .22 or .45 conversion requires that you remove the registered bolt, and then you no longer have a fully automatic weapon. The other disadvantage of a registered bolt is that the receiver is typically left unmodified or slightly modified. Because of that, you might be stuck using semi automatic parts instead of the cheaper and more widely available SMG parts. Some class II dealers registered bolts because of availability and the ease in which it could be done in the mad rush to register guns before the 1986 ban. On the other hand, if you have a registered receiver, the manufacturer could modify the receiver in any way he wanted. The receiver could be converted to be identical to an original SMG receiver. Once that's done, any SMG part can be used, giving you a cheap supply of spare parts. Also, since any bolt can be used in the receiver, caliber conversions are not a problem. The only drawback with a registered receiver is that a damaged receiver cannot be replaced - but that's not much of a disadvantage because of the durability of an UZI receiver. Registered receivers are generally considered a better option and will usually command a higher price than a registered bolt. There's one important point to remember with a registered receiver. The manufacturer COULD modify the receiver to be 100% the same as an SMG receiver, but they didn't have to. Depending on who did the work, it could have been a minimal conversion or a complete conversion. Know what you're getting before you buy. Was the blocking bar removed? If not, then an SMG bolt can't be used and a sloted bolt would be necessary and inseparable from the receiver. Was the barrel restrictor ring removed and barrel trunion bored out? If not, then SMG barrels could not be used and you'll have a harder time getting the barrels you want. If the gun is a Mini UZI, was the trunion milled out to make space for the full auto Mini UZI bolt feet? If not, a semi automatic bolt would have to be used. Not all registered receivers are created equal! Finally, know who did the conversion and stick to the manufacturers that did quality work. Poor workmanship could cause trunions to be out of alignment, tolerances to be out of spec, metal to be brittle due to overheating. Any of these problems will adversely affect the enjoyment of your UZI and the large investment you made in it. Registered Receiver: A registered receiver conversion is probably the most desirable - assuming the bolt blocking bar was removed - because it's the most versatile and capable of being an almost exact copy of a factory SMG UZI. However, not all registered receivers have the bolt blocking bar removed. If they don't, their versatility and value are similar to a registered bolt gun because a slotted bolt is "married" to the receiver - meaning that the bolt can never be separated from the receiver. The ATF no longer allows the rail to be removed and the bolt replaced by an unslotted bolt. Registered Bolt: They are normally a regular SMG open bolt that has been slotted on the side to clear the bolt blocking bar and have been milled in the front to clear the barrel restrictor ring found on the semi automatic full size UZI receiver. There are less common variations of the registered bolt including some that were registered closed bolts. Fleming did some Mini Uzi Closed bolt conversions. There are quite a few registered bolts that were cut down for use in a Mini or Micro/UZI Pistol. Neither the Mini nor Micro/UZI Pistol ever had the bolt blocking bar, making it easier to move a registered bolt from gun to gun. In fact, you could move the bolt around between a Mini and a Micro/Pistol provided you fabricate special cocking lugs for the respective top cover. Registered Sear: Most of these are Fleming registered sears that are permanently married to the receiver. Qualified also did some registered sears that are not married to any receiver but these are extremely rare. Registered LaFrance MG Conversion Kit: These consisted of a short barrel, slotted bolt and modified lower. These had all of his information engraved on the front of the magazine well and as such are sometimes referred to as a registered "lower". There was also a matching serial number on top of the bolt and usually his logo above it. Possible registered "kicker": The "kicker" conversion was mentioned in the September 1984 issue of Firepower magazine. Being that they were around at that time, there is a possibility that some of them were registered. The full size UZI carbine which came as the Model A and Model B. The Mini UZI Carbine. Although the Mini UZI carbine did not enter the US until 1987, registered bolts for the Mini UZI can be found. The UZI Pistol, which came into the US in 1984 and was actually introduced by IMI before the full auto Micro UZI. Semi UZI's in all three sizes share some common characteristics that may have been addressed during a conversion. If you are evaluating a conversion for purchase, you should inspect each of these items and understand what state it's in. It will have some bearing on the value of the gun, what parts can be interchanged in the gun and whether the gun will function properly or not. The semi automatics are all closed bolt and the lower "lip" on the bolt face has been milled off as seen in this photo. For full auto use, the bolts must have a fully supported bolt face (the lower lip must be present.) This is true for both open and closed bolt full auto operation. The semi automatic extractors are different from the SMG extractors. The lower corner of the semi automatic extractor has been removed, making it unreliable for full auto firing. An SMG extractor should be installed before full auto use. Semi automatics all use sears that are specific for the semi automatic models. The sear pads (the notches that stick up through the bottom of the receiver) are smaller both in length and width. Correspondingly, the holes in the receiver that the sear pad passes through are smaller in the semi than on the full auto. This is a picture of an unconverted semi Model A's sear and openings in the bottom of the receiver. The openings may look large enough to accommodate an SMG sear but they are not. The top cover slot cover on semi automatics have a legal disclaimer stamped on them. While it's purely cosmetic, it needs to be replaced to be consistent with an original SMG. Since the semi automatics are all closed bolt, they do not need the serrated top cover, which is a safety device for open bolt guns. If your conversion is an open bolt, the top cover should be replaced with a serrated top cover. Leave the barrel restrictor ring unaltered. This requires the use of modified bolts and barrels instead of standard SMG parts. (Full size UZI bolts made by Group bolt were relieved so they would not contact the restrictor ring.) 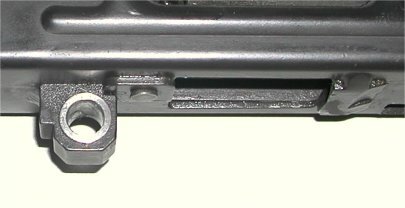 Note that with the Mini and Micro UZI, the restrictor ring only obstructs the factory IMI SMG open bolt, not the closed bolt. Trim down the top and sides of the restrictor ring. This allows you to use standard SMG bolts, which now have enough clearance to pass over the restrictor ring. The remaining portion of the restrictor ring gives good support to the barrel but still requires you to use barrels with a smaller chamber end like a semi automatic barrel. Completely mill off the restrictor ring. This allows you to use of all factory SMG barrels (assuming the trunion is also made compatible) and bolts and still leaves the semi automatic feed ramp for excellent feeding of virtually all ammo types. This is the most desirable type of modification. As mentioned above, if the restrictor ring is not trimmed or completely milled off, it will rub against an SMG bolt. Group Industries machined both their semi and SMG bolts so that either one would clear the ring for ease of manufacturing rather than doing two different styles. (Note the added clearance in the photo at the 2 o'clock position to the bolt face.) Using a Group Industries bolt, someone doing a conversion wouldn't have to worry about messing with the ring or modifying a bolt. Fleming commonly did this with his conversions. All the semi automatic UZI's have a 9mm hole in the trigger group lug that is welded on the bottom of the receiver, and a 9mm pin that goes through the trigger group and the lug. This is to prevent installing an SMG lower (which have 8mm holes) on a semi receiver. A conversion can account for this in one of two ways. Either it can reduce the hole size in the lug to 8mm to match an SMG lower, or it can use semi lower with a 9mm hole and convert it to full auto. One exception to this size issue is that the factory Micro SMG and the UZI Pistol both use a 9mm trigger group lug/pin. This example shows a bushing that has been installed in the trigger group lug, reducing it to 8mm so an SMG pin/lower can be properly installed. Rewelding this area rather than using a bushing is also an option. 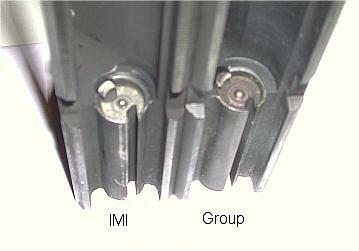 The selector bar has notches that engage the fire selector spring so that the bar does not move during firing. A semi automatic fire selector bar just has two notches. A third notch should be added so the bar does not move when set to full auto. 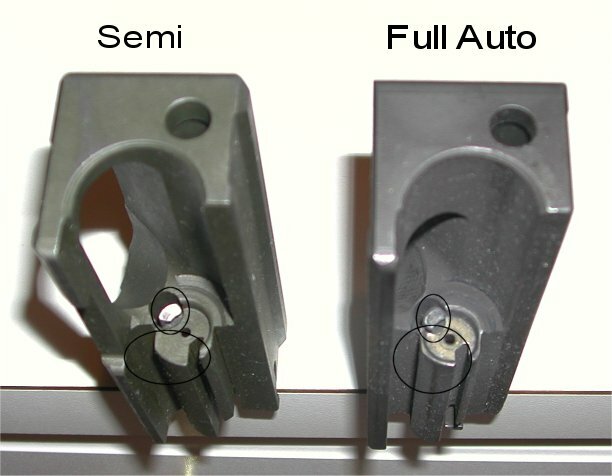 Semi automatics have a two position selector switch, marked "F" and "S". For cosmetic and safety reasons, a conversion should identify the third position for full auto fire. An "A" should be stamped into the third position. Some conversions will change the "F" to an "R" to look like an original SMG. The original receivers are all marked in such a way to identify them as semi automatic. For aesthetic purposes, the receivers can be remarked to look like an original SMG - within the restrictions set forth by the ATF. You cannot alter the serial number of the gun and since all semi automatic UZI's have a serial number prefix identifying their semi automatic model, no conversion can be marked 100% correctly.